Ships tomorrow if you order in the next 16 hours 52 minutes. Bragg Organic Raw Apple Cider Vinegar is made from delicious, healthy, organically grown apples, aged in wood. 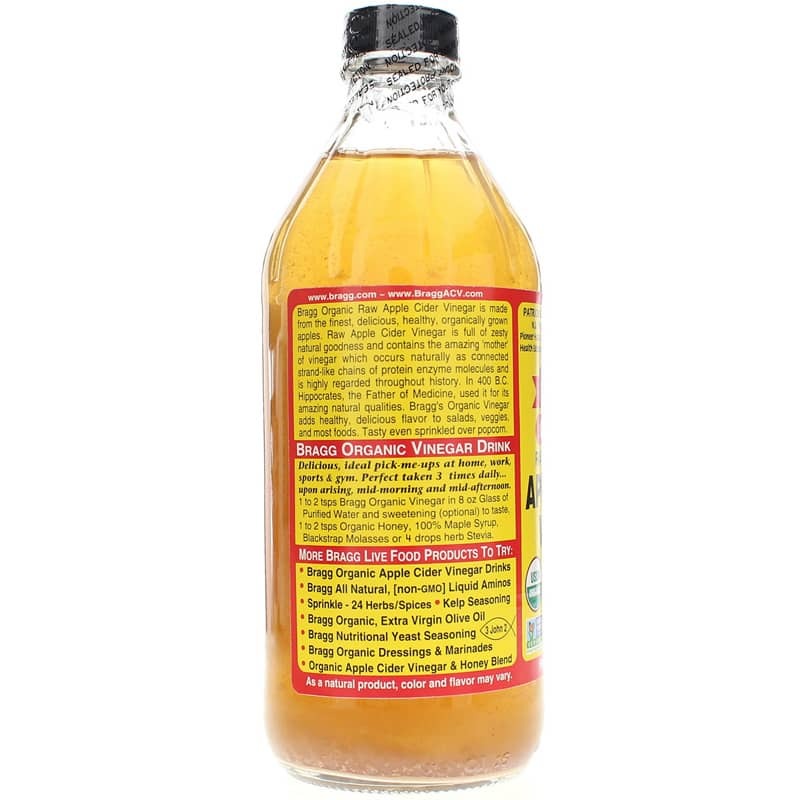 It is full of zesty natural goodness and contains the amazing "mother" of vinegar which occurs naturally as connected strand-like chains of protein enzyme molecules and is highly regarded throughout history. Processed and bottled in accordance with USDA guidelines, it is Certified Organic by Organic Certifiers and Oregon Tilth; and is Kosher Certified. It is a wholesome way to add delicious flavor to salads, veggies, most foods, and even sprinkle over popcorn. 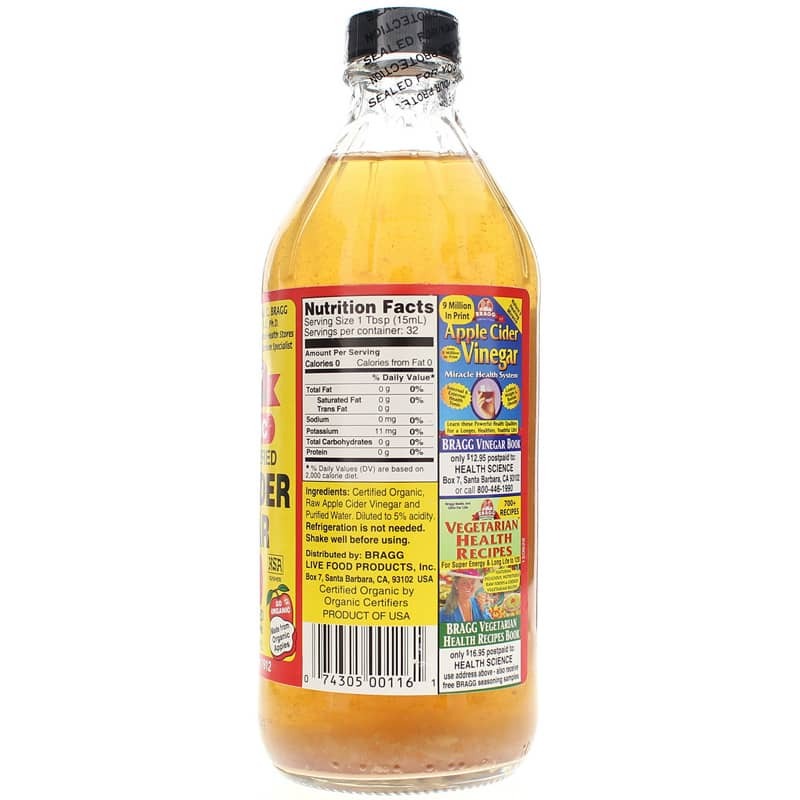 Bragg's Apple Cider Vinegar is raw, unfiltered, undiluted, unheated, unpasteurized and contains no preservatives. Many medical studies show the health benefits of Apple Cider Vinegar. Hippocrates, the Father of Medicine, in 400 BC treated his patients with natural apple cider vinegar for its powerful cleansing, healing and germ fighting qualities. Shake well. Add to salads, veggies, most foods and even sprinkled over popcorn. This is a delicious, pick-me-up at home, work, sports or gym. It is perfect taken 3 times daily – upon rising, mid-morning and mid-afternoon. 1 to 2 teaspoons Bragg Organic vinegar in 8 ounces of purified water and (optional) to taste 1 to 2 teaspoons organic honey, 100% maple syrup, blackstrap molasses or 4 drops herb Stevia. Perfect for salads, dressings, greens, dips, marinades, veggies and most foods. I use this apple cider vinegar to put on my salads and I also sometime mix a TBSP of it with a glass of water to help the digestion of a meal. It totally prevents bloating for me whenever I eat anything that isn't cooked (such as raw vegetables)! I think it is a very good deal! 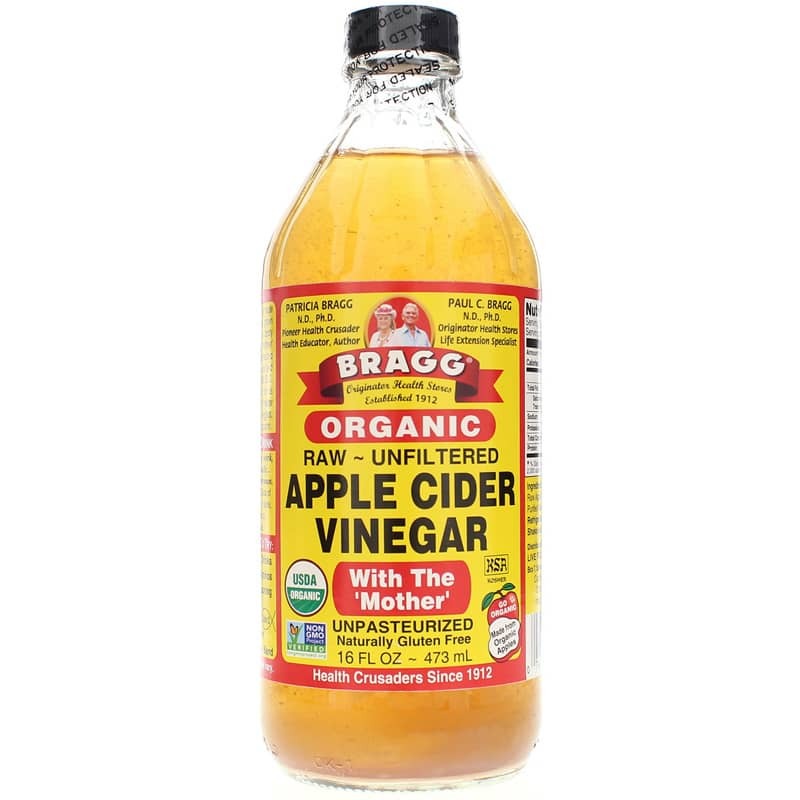 I use this apple cider vinegar to put on my salads and I also sometime mix a TBSP of it with a glass of water to help the digestion of a meal. I think it is a very good deal! Besides the obvious uses in food, Apple Cider Vinegar Organic Raw also has many benefits that you can look up. NHC also does a great job of packing this securely and ships fast. Definitely will be a returning customer. have used this for many years and it is very good. easy to purchase thru Natural Healthy Concepts, dont have to leave the house. Burnieherbs unless this ACV has some special property different from all other braggs ACV, the cost of $14.50 per 32 ounce vs $5.50 is questionable.. Double check price per 32 ounce bottle, can't be $14.50. Have not seen that size anywhere on the web or in the store for more than $6.00.